January 20th - February 19th. The otter is quirky and unusual. Sometimes they're hard to figure out. They have unique ways of looking at things and therefore have problem solving skills many simply do not. The otter is courageous, honest, and sympathetic. February 20th - March 19th. The wolf is mysterious, passionate, and at times emotional. They understand things about the world that many do not. They are good listeners and observers, but often remain an enigma to the people in their lives. March 20st to April 19th. The falcon has a keen eye and is often a natural born leader. Just as we look up at falcons in the sky, many look up to the falcon for direction. They are supportive, but they don't give much away. At their worst, the falcon can be intolerant and impatient. The beaver is the engineer of the Native American zodiacs. They create strategies and make the big plans. They're witty, hard working, and rather brilliant, but they can also be possessive and nervous. May 21st to June 20th. The deer is fast and inspiring. They have a great sense of humor and can get a laugh out of nearly anyone. They're always aware of their surroundings, but the deer can be self-involved and moody as well. June 21st to July 21st. Woodpeckers are the most nurturing of the Native American zodiacs. They are empathic listeners and often go out of their way to make the world a better place. They make wonderful parents and partners and tend to be resourceful. The woodpecker is hard headed though, making them susceptible to anger, jealousy, and possessive behavior. July 22 to August 21st. The salmon is smart, creative, and an electric personality. They're naturally enthusiastic and their love of life is infectious. They need great goals and purpose, otherwise they may find themselves mired in egotistical or depressed behaviors. August 22nd to September 21st. The bear is quiet and pragmatic, but when prodded, is a force to be reckoned with. They make excellent business partners and tend to be the voice of reason in a group of family or friends. The bear is patient and tolerant, but only up to a point. September 22nd to October 22nd. The raven is a natural charmer and businessperson. They're incredibly sharp and know how to get what they need. They're very social, not often appearing too far away from a city or a larger town. They're adaptive, often imitating activities they see as smart. October 23rd to November 22nd. 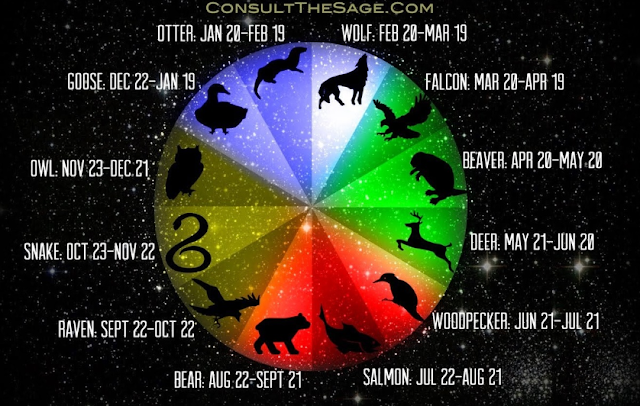 The snake is the most spiritual of all of the Native American zodiacs. They're attuned to the spirit world here and beyond. They are respected for their abilities in the medical field, as well as in the shamanistic world. November 23rd to December 21st. The owl is hard to pin down. They are warm and easy going, but they're also sometimes battle hardened and ready to go full speed. They can be so wise, and yet so reckless. December 22nd to January 19th. The goose is the ambitious peacekeeper. They are determined to succeed no matter what. Failure doesn't come easy to them. They are driven and naturally talented at many things.